School is fun when studies are conducted with effective ways. No doubt kids need to pay attention and teachers’ must also tune their teaching methods as per requirements. This is exactly what happens when things are executed efficiently. One of the most recent was the educational trip at Thailand’s best Khao Kheow Open Zoo by 800 Sattahip students. These were the lucky ones who got the chance to learn wildlife n details. There were creative lessons conducted by teachers that can help preservation of animals and natural resources from the Khao Kheow Open Zoo and in future anywhere they go. There were many contributions from different schools and institutions and one of the most recent has come on July 31 from Zoo Assistant Director Aphidet Singhsaenee. 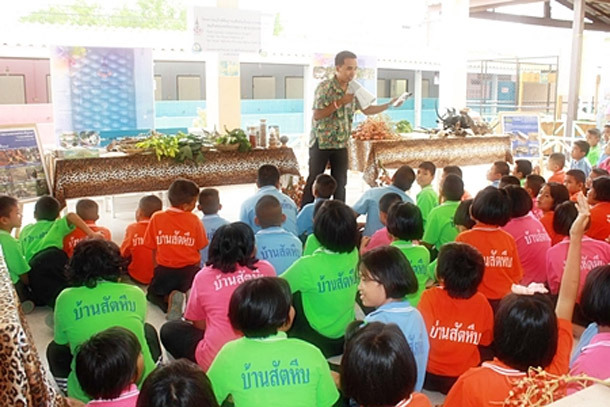 He led pupils from Sattahip School and visited Khao Kheow Open Zoo. This seminar was included in the education master plan by the Zoological Park Organization in the NaturalResources and Environment Ministry. The engaging wildlife trip to Khao Kheow Zoo is where students of Sattahip learnedupbeat facts about animals and other species. These students were taught about the importance of natural treasures and how to live sustain and live with Mother Nature. The reason why this special visit was conducted in Khao Kheow Zoo was to spread the awareness among local youths about animal conservation, appreciated and to inculcate value in school students’ about natural resources. This was a practical way to teach students about these real issues. Animals were used in the training tomake students more familiar with wildlife. Such approach helps visitors to understand what exactly can be done to preserve wildlife. Students were kept ready and prepared with exciting activities such as “Who can tell me what this is?” where teacher or instructor will point out at certain bird, animals or plants or any other part of wildlife. Just to know students how much these students know and to encourage to learn details about Nature. Other activities such as recycling, animal behavior, wildlife identification, plant genealogy. It also included the close up project for animal and a primer on HM the King’s economy philosophy.